Native Americans in the United States have historically had extreme difficulty with the use of alcohol. Problems continue among contemporary Native Americans; 12% of the deaths among Native Americans and Alaska Natives are alcohol-related. Use of alcohol varies by age, gender and tribe with women, and older women in particular, being least likely to be regular drinkers. Native Americans, particularly women, are more likely to abstain entirely from alcohol than the general US population. Frequency of use among Native Americans is generally less than the general population, but the quantity consumed when it is consumed is generally greater. 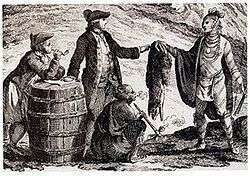 Fur traders doing business with Native Americans in 1777, with a barrel of rum to the left. A survey of death certificates over a four-year period showed that deaths among Native Americans due to alcohol are about four times as common as in the general US population and are often due to traffic collisions and liver disease with homicide, suicide, and falls also contributing. Deaths due to alcohol among Native Americans are more common in men and among Northern Plains Indians. Alaska Natives showed the least incidence of death. Alcohol abuse by Native Americans has been shown to be associated with development of disease, including sprains and muscle strains, hearing and vision problems, kidney and bladder problems, head injuries, pneumonia, tuberculosis, dental problems, liver problems, and pancreatitis. In some tribes, the rate of fetal alcohol spectrum disorder is as high as 1.5 to 2.5 per 1000 live births, more than seven times the national average, while among Alaska natives, the rate of fetal alcohol spectrum disorder is 5.6 per 1000 live births. Native American youth are far more likely to experiment with alcohol than other youth with 80% alcohol use reported. Low self-esteem is thought to be one cause. Active efforts are underway to build self-esteem among youth and to combat alcoholism among Native Americans. Prior to contact with colonists, alcohol use and production was mainly concentrated in the southwestern United States.Some tribes produced weak beers, wine and other fermented beverages, but they had low alcohol concentrations (8%-14%) and were to be used only for ceremonial purposes. The distillation technique required to make stronger, potent forms of alcohol was unknown. It was well documented that Mexican Native Americans prepared over forty different alcoholic beverages from a variety of plant substances, such as honey, palm sap, wild plum, and pineapple. In the Southwestern U.S., the Papago, Piman, Apache and Maricopa all used the saguaro cactus to produce a wine, sometimes called haren a pitahaya. The Coahuiltecan in Texas combined mountain laurel with the Agave plant to create an alcoholic drink, and the Pueblos and Zunis were believed to have made fermented beverages from aloe, maguey, corn, prickly pear, pitahaya and even grapes. To the east, the Creek of Georgia and Cherokee of the Carolinas used berries and other fruits to make alcoholic beverages, and in the Northeast, there is some evidence that the Huron made a mild beer made from corn. In addition, despite the fact that they had little to no agriculture, both the Aleuts and Yuit of Alaska were believed to have made alcoholic drinks from fermented berries. When Europeans began making a large quantity of distilled spirits and wine available to American Indians, the tribes had very little time to adapt and develop social, legal, or moral guidelines to regulate alcohol use. Early traders built a large demand for alcohol by using it as a means to trade, using it in exchange for highly sought after animal skins and other materials and resources. Traders also discovered that giving free alcohol to the Native Americans during trading sessions made the likelihood of trading much higher. Extreme intoxication was common among the colonists, and they had almost mastered the art of binge drinking alcohol, contrary to the inexperienced Indian populations. Numerous historical accounts describe extremely violent bouts of drinking among Indian tribes during trading sessions and on other occasions, but at least as many accounts exist of similar behavior among the colonizing traders, military personnel, and civilians. Such modeling was not limited to the early colonial era but continued as the land was colonized from east to west; trappers, miners, soldiers, and lumbermen were notorious for their heavy drinking sessions. History may have therefore sown the seeds for the prevalence of alcohol abuse in North American indigenous populations. Early demand, with no regulation and strong encouragement, may have contributed to a heavy alcohol use. It was then passed down from generation to generation, which has led to the current high level of alcohol-related problems. The use of alcohol originated in Middle America but rapidly diffused to Northern Mexico and from there to the Southwestern United States. The majority of aboriginal production and use of alcoholic beverages was in this region. However, there was a surprising number of scattered accounts of intoxicating beverage use throughout the United States prior to White contact. For the most part, the use of alcoholic drinks required an agricultural base but not in all instances. The reason for this is primarily that alcoholic beverages were made from domesticated plants, but there are examples of liquor being derived from wild plants. Aboriginal use generally did not involve excessive drunkenness but controlled and supervised use often in highly ritualized occasions. Further, accounts of American Indians' initial encounters with alcoholic beverages did not describe reckless or disinhibited behavior. Rather than infatuation, most Native peoples initially responded to alcohol with distaste and suspicion. They considered drunkenness "degrading to free men" and questioned the motives of those who would offer a substance that was so offensive to the senses and that made men foolish. Most Native people who did drink alcohol were reported to show "remarkable restraint while in their cups". Most drank alcohol only during social or trading contact with whites. Although drinking patterns since colonization grew almost exponentially, since 1975, drinking patterns among Native Americans have remained constant. had a natural craving for alcohol, were sensitive to alcohol, became belligerent when they were intoxicated, were susceptible to alcohol addiction, and could not resolve such problems on their own. The scientific literature has refuted the claims to many of these myths by documenting the wide variability of alcohol problems across and within Native tribes and the very different response that certain individuals have to alcohol opposed to others. Another important way that scientific literature has refuted these myths is by identifying that there are no current discovered genetic or other biological anomalies that render Native peoples particularly vulnerable to alcoholism. It has been found that the incidence of alcohol abuse varies with gender, age, and tribal culture and history. While little detailed genetic research has been done, it has been shown that alcoholism tends to run in families with possible involvement of differences in alcohol metabolism and the genotype of alcohol-metabolizing enzymes. There is no evidence, however, that these genetic factors are more prevalent in Native Americans than other ethnic groups. According to one 2013 review of academic literature on the issue, there is a "substantial genetic component in Native Americans" but that these factors are "similar in kind and in magnitude to the genetic influences contributing to the liability for these phenotypes in other ethnic groups." Many scientists have substantiated the genetic component of alcoholism by the biopsychosocial model of alcoholism, but the molecular genetics research currently has not found a specific gene that is responsible for showing the rates of alcoholism among Native Americans. The National Institute on Alcohol Abuse and Alcoholism, or NIAAA, defines binge drinking as a pattern of drinking that brings blood alcohol concentration (BAC) levels to 0.08 g/dL. This typically occurs after 4 drinks for women and 5 drinks for men, in about 2 hours. Anastasia M. Shkilnyk who conducted an observational study of the Asubpeeschoseewagong First Nation of Northwestern Ontario in the late 1970s, when they were demoralized by Ontario Minamata disease, has observed that heavy Native American drinkers may not be physiologically dependent on alcohol, but they abuse it by engaging in binge drinking, a practice associated with child neglect, violence, and impoverishment. Tolerance: need to drink greater amounts of alcohol in order to "get high"
Indian youth become socialized into the culture of alcohol at an early age this pattern of testing alcohol limits persists until early adulthood. Approximately 20 percent of Indian youth between 7th and 12th grade belong in this category. Other youth exhibit an experimental pattern of drinking through adolescence and this is noted as one of the biggest identifiers of binge drinking later in life. Given the high rates of alcohol and substance abuse on reservations, researchers have seen higher rates of academic failure, delinquency, violent criminal behavior, suicidality, and alcohol-related mortality among Native American youth, which is far greater than the rest of the United States population. Compared with the US population in general, the American Indian population is much more susceptible to alcoholism and related diseases and deaths. According to IHS records on alcohol-related illness, the mortality due to alcohol was as much as 5.6 times higher among the Indian population than among the U.S. population in general. The rate was 7.1 times higher in 1980. Disproportionately more males are affected by alcohol related conditions than females. The highest risk of alcohol-related deaths is between 45 and 64. Chronic liver disease and cirrhosis are 3.9 times as prevalent in the Indian population as in the general U.S. population. Alcohol-related fatal car accidents are three times as prevalent. Alcohol was shown to be a factor in 69% of all suicides of American Indians. This number has grown larger since 1975. Native Americans have one of the highest rates of fetal alcohol syndrome recorded. According to the Centers for Disease Control and Prevention, from 1981 to 1991, the prevalence of FAS in the overall US population per 10,000 births was 2.1. Among American Indians, that number was 31.0. The significant difference between the FAS rates of the US population and American Indians has been attributed to a lack of healthcare, high poverty levels, and a young average population. Healthcare spending for an average American on Medicare is about $11,762 whereas average spending on healthcare for a Native American is $2,782. In a 2007 document, "Fetal Alcohol Spectrum Disorders among Native Americans," the US Department of Health and Human Services reported that the prevalence of fetal alcohol syndrome in Alaska was 1.5 per 1,000 live births but, among American Indians and Alaska Natives, the rate was 5.6. The Alcohol and Substance Abuse Program (ASAP) is a program for American Indian and Alaska Native individuals to reduce the incidence and prevalence of alcohol and substance abuse. These programs are administered in tribal communities, including emergency, inpatient and outpatient treatment and rehabilitation services for individuals covered under Indian Health Services. It addresses and treats alcoholism from a disease model perspective. The Indian Alcohol and Substance Abuse Prevention and Treatment Act of 1986 was updated to make requirements that the Office of Indian Alcohol and Substance Abuse (OIASA) is to work with federal agencies to assist Native American communities in developing a Tribal Action Plan (TAP). The TAP coordinates resources and funding required to help mitigates levels of alcohol and substance abuse among the Native American population. ↑ Hyde, George E. (1974). The Pawnee Indians (Revised ed.). Norman: University of Oklahoma Press. p. 200. ISBN 0-8061-2094-0. ↑ Beals J, Spicer P, Mitchell CM, et al. (October 2003). "Racial disparities in alcohol use: comparison of 2 Native American reservation populations with national data". Am J Public Health. 93 (10): 1683–5. doi:10.2105/AJPH.93.10.1683. PMC 1448033 . PMID 14534221. 1 2 "Fetal alcohol syndrome–Alaska, Arizona, Colorado, and New York, 1995-1997". Morbidity and Mortality Weekly Report. 51 (20): 433–5. 2003. ↑ "Health problems in American Indian/Alaska Native women". National Women's Health & Information. ↑ "Fighting Alcohol and Substance Abuse among Native Americans and Alaskan Native Youth. ERIC Digest." 1 2 3 4 5 6 7 Frank, J W, R S Moore, and G M Ames. “Historical and Cultural Roots of Drinking Problems among American Indians.” American Journal of Public Health 90.3 (2000): 344–351. Print. 1 2 3 4 5 Fred, Beauvais (1998). "American Indians and Alcohol". Spotlight on Special Populations. 22 (4). ↑ McPherson, Kevin, and Peter Wakefield. "The Perfect Colonizer: Understanding Alcoholism and its Treatments in Native America through Humanistic Inquiry. "Journal of Student Research 4.1 (2015): 174-179. 1 2 3 4 Coyhis, Don, and William L. White. "Alcohol problems in Native America: Changing paradigms and clinical practices." Alcoholism Treatment Quarterly20.3-4 (2002): 157-165. ↑ Caetano, Raul, Catherine L. Clark, and Tammy Tam. "Alcohol consumption among racial/ethnic minorities." Alcohol health and research world 22.4 (1998): 233-241. ↑ Wall, Tamara L., Lucinda G. Carr, and Cindy L. Ehlers. "Protective association of genetic variation in alcohol dehydrogenase with alcohol dependence in Native American Mission Indians." American Journal of Psychiatry 160.1 (2003): 41-46. ↑ "Drinking Levels Defined | National Institute on Alcohol Abuse and Alcoholism (NIAAA)". www.niaaa.nih.gov. Retrieved 2015-11-20. ↑ Anestasia M. Shkilnyk (March 11, 1985). A Poison Stronger than Love: The Destruction of an Ojibwa Community (trade paperback). Yale University Press. p. 21. ISBN 0300033257. ↑ Marshall, E. Jane, Keith Humphreys, and David M. Ball. The Treatment of Drinking Problems: A Guide to the Helping Professions. Cambridge University Press, 2010. ↑ Stanley, Linda R., et al. "Rates of Substance Use of American Indian Students in 8th, 10th, and 12th Grades Living on or Near Reservations: Update, 2009–2012." Public Health Reports 129.2 (2014): 156. ↑ May, Philip A. "Overview of alcohol abuse epidemiology for American Indian populations." Changing numbers, changing needs: American Indian demography and public health (1996): 235-261. ↑ May, Philip A., et al. "Alcohol and suicide death among American Indians of New Mexico: 1980–1998." Suicide and Life-Threatening Behavior 32.3 (2002): 240-255. 1 2 Jones, Loring. "The distinctive characteristics and needs of domestic violence victims in a Native American community." Journal of Family Violence 23.2 (2008): 113-118. ↑ Building Domestic Violence Health Care Responses in Indian Country: A Promising Practices Report. Family Violence Prevention Fund, 2010. ↑ Coughlin, Teresa A. "Health Policy for Low-Income People in Minnesota." (1997). ↑ Montag, Annika C., et al. "Preventing Alcohol‐Exposed Pregnancy Among an American Indian/Alaska Native Population: Effect of a Screening, Brief Intervention, and Referral to Treatment Intervention." Alcoholism: Clinical and Experimental Research 39.1 (2015): 126-135. ↑ "Alcohol and Substance Abuse Program | Indian Health Service (IHS)". www.ihs.gov. Retrieved 2015-11-20. ↑ ann.lynsen. "TAP". www.samhsa.gov. Retrieved 2015-11-20.